Students lined up in the foyer of the Spee Club to sign a book in memory of Courtney S. Blair '19. 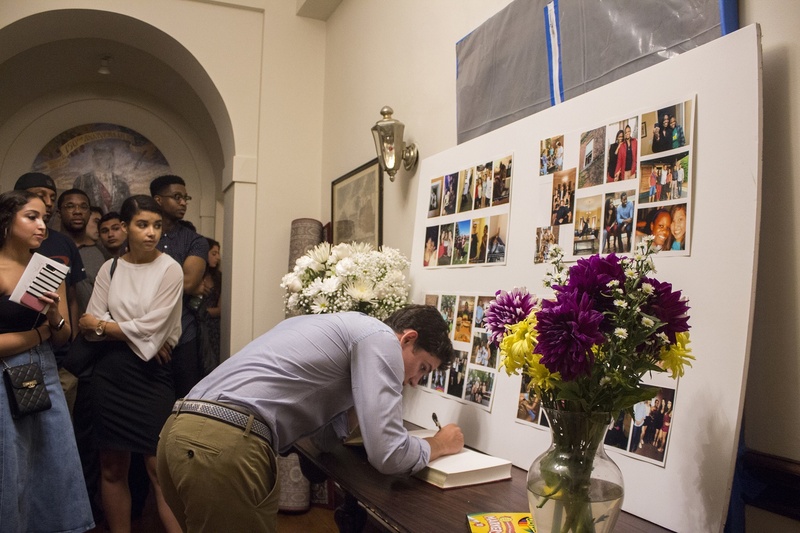 Recalling the Harvard senior's humor and friendship, more than 100 students and friends came together Thursday evening to celebrate the life of Courtney S. Blair '19. At the gathering, held at the Spee Club, friends and former roommates stood up one by one to share stories of meaningful experiences they shared with Blair. The anecdotes, both funny and serious, underscored the unconditional love Blair held for her friends and the joy she brought to everyone who knew her. Attendees aimed to paint a full picture of Blair’s time at the College, ranging from first encounters during the admitted students weekend, Visitas, to late-night conversations in her dorm room. Pictures of Blair lined the walls of the clubhouse Thursday. Flowers and candles lay scattered around the upstairs room in which the service was held. Students snacked on Fruit Gushers — one of Blair’s favorite foods, according to Corrigan. Undergraduates who had known Blair pressed into a large upstairs room to remember and to say goodbye. So many of them came that the crowd overflowed into the adjacent stairwell. “The fact that so many people were here, too, was just a testament to how much Courtney touched all of us,” Corrigan said. During her time at Harvard, Blair worked at the Harvard Shop, was a member of the Spee, participated in the boxing club, and tutored students in economics and statistics. This past summer, she worked as an intern for the Boston Consulting Group in her home state. At the service, multiple attendees mentioned Blair's drive and predicted that she would have been the CEO of a major company, had she lived. Several attendees said the event was meant to bring people together to create a “sacred space” to allow everyone to cope with the loss. After the service, some students lingered in the Spee to more informally share memories of Blair. Dozens lined up to sign the guest book for the event.